Go to Irritant Contact Dermatitis, Allergic Contact Dermatitis, and Protein Contact Dermatitis for complete information on these topics. 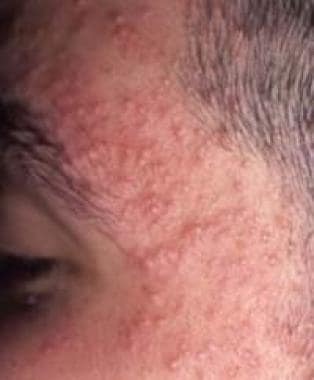 Examples of contact dermatitis are shown in the images below. Dry, fissured, pruritic eczema is frequently the result of excessive washing and very low humidity in cold climates. 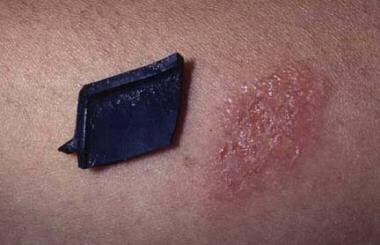 Irritant contact dermatitis is due to direct injury of the skin. 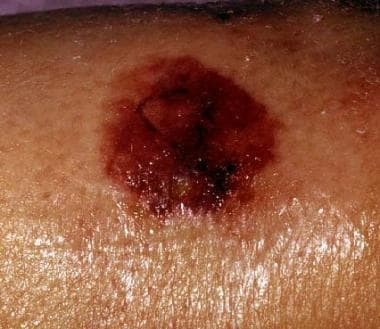 In this patient, frequent handwashing and use of soap is the cause of damage to the protective layers of the upper epidermis. Patients should be educated about the cause of the dermatitis and instructed in methods of skin protection and care with emollients. Nickel is the most frequent contact allergen in females older than 8 years, and allergy occurs in as many as 25% of females 14 years or older. Allergens, such as nickel, are impossible to completely avoid. Exposure can be reduced with careful instruction, but occult exposures may produce chronic or recurrent symptoms. Nickel in the watch and watch band produced this episode of allergic contact dermatitis. Allergic reactions to rubber products are usually caused by antioxidants and accelerators added in the manufacturing process, rather than the rubber itself. Antioxidants help preserve the rubber, and accelerators help in the vulcanization process. Exposure to rubber in gloves, shoes, undergarments, tires, heavy-duty rubber goods, and sport goggles is common. The typical eruption from poison ivy includes erythema, edema, papules, vesicles, and bullae. Linear streaks as in this patient are characteristic but are not always present. Initial yellow crusts are dried serum from ruptured bullous lesions and not evidence of infection. Oleoresin (urushiol), which exudes from damaged areas of poison ivy, poison oak, and poison sumac, turns black after exposure to air. Fresh oleoresin on the skin dries and may be observed as black smudges or spots. When limes are squeezed into beverages, excess juice remains on the skin. Many other foods can cause similar reactions, i.e. the phytophotodermatitis. Sun exposure of this lime juice produces areas of dermatitis or hyperpigmentation. Perfumes are also common sources of photo contact dermatitis. Most common moisturizers contain various additives and preservatives. 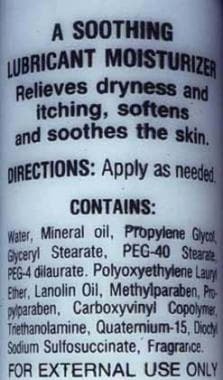 The list of ingredients on this bottle is not uncommon, and most of these agents are capable of causing allergic contact dermatitis. Patch testing with dilute concentrations of the individual ingredients can be used to identify the agent that is a problem for any particular patient. Areas of acute contact dermatitis respond well to cool compresses and wound care. Moist compresses are soothing, have a mild antipruritic effect, reduce serous drainage, and gently debride the wound. Clean water, isotonic sodium chloride solution, and Burow solution all can be used. Compresses should be kept moist at all times. Wet-to-dry compresses are painful and destroy fragile tissues. Following moist compress applications for 5-10 minutes, affected sites should be gently cleared of loose crusts and a thin coat of Vaseline or antibacterial ointment should be applied. Urticaria, also known as hives or whelps, involves edematous pale or pink plaques. Agents can produce urticaria by immunologic reactions, by nonimmunologic reactions, or by unknown mechanisms. Nonimmunologic reactions are most common. Other types of environmentally associated urticaria must be excluded. 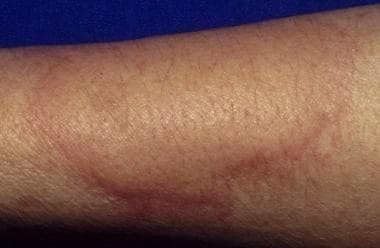 This is an example of cold urticaria produced by application of an ice cube to the dorsum of the arm. Prolonged use of moderate- to high-potency topical steroids may cause skin atrophy or steroid acne. This patient used a moderate-strength steroid, triamcinolone 0.1%, in this area for several weeks. Steroid acne, also called steroid rosacea, has a classic appearance with monomorphic erythematous papules. If the steroid is discontinued, the condition usually worsens. Patients must understand that symptoms worsen before they improve, and several weeks or months are required to taper off this steroid. This purpuric reaction was noted after application of eutectic mixture of local anesthetics (EMLA) for 1 hour. EMLA cream is widely used as a local anesthetic for superficial procedures. Blanching and redness are commonly observed side effects. Dramatic purpuric reactions to EMLA, as in this patient, have been reported. Patch test results in these patients with the individual ingredients of EMLA cream, EMLA cream itself, placebo cream, and Tegaderm are negative. Apparently, the purpuric reaction is not of an allergic nature, but the cream may have a toxic effect on the capillary endothelium. Allergic contact dermatitis in childhood was considered rare until recently. However, reports of this condition are increasing, which may reflect an increased incidence, more frequent patch testing of children, or both. [2, 3] Allergen exposure in children has also likely changed over time. Allergic contact dermatitis may affect as many as 20% of the pediatric population. It occurs less frequently in the first few months of life and increases in prevalence with increasing age. Once diagnosed, most cases of contact dermatitis are self-limited or are easily treated. However, morbidity from contact dermatitis depends on its cause and the possibility of avoiding repeated or continued exposure. Unless the diagnosis of contact dermatitis is considered and appropriate history is obtained, a correct diagnosis is rarely made. As a result, the patient may have chronic or recurrent episodes of dermatitis. A comprehensive review of the topic of contact dermatitis is beyond the scope of this article. Several major textbooks are dedicated to this subject. One of the more comprehensive textbooks on this subject is Fisher's Contact Dermatitis. It contains over 1100 pages discussing contact dermatitis associated with numerous products, occupations, hobbies, and other environmental sources. In addition, industry continues to create new contactants on a daily basis. Irritant contact dermatitis is a condition caused by direct injury of the skin. An irritant is any agent capable of producing cell damage in any individual if applied for sufficient time and in sufficient concentration. Immunologic processes are not involved, and dermatitis occurs without prior sensitization. Irritants cause damage by breaking or removing the protective layers of the upper epidermis. They denature keratin, remove lipids, and alter the water-holding capacity of the skin. This leads to damage of the underlying living cells of the epidermis. Irritant contact dermatitis consists of a spectrum of disease that ranges from a mild dryness, redness, or chapping to various types of eczematous dermatitis or an acute caustic burn. 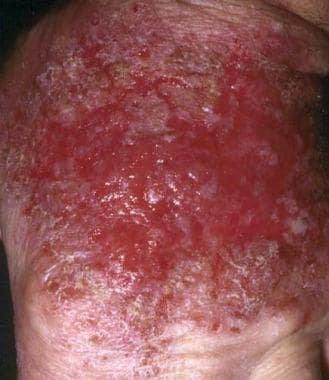 The severity of dermatitis produced by an irritant depends on the type of exposure, vehicle, and individual propensity. Normal, dry, or thick skin is more resistant to irritant effects than moist, macerated, or thin skin. Cumulative irritant dermatitis most commonly affects thin exposed skin, such as the backs of the hands, the webspaces of the fingers, or the face and eyelids. Irritant contact dermatitis most commonly produces symptoms of pain or burning. With severe irritant contact dermatitis, symptoms may develop within seconds or minutes following exposure. Patients with allergic contact dermatitis usually report itching, and, following exposure to an antigen, symptoms require several hours to develop. Allergic contact dermatitis is a type IV (ie, delayed) hypersensitivity reaction that affects previously sensitized individuals only. A common example of allergic contact dermatitis is rhus dermatitis, the allergic reaction to plants such as poison ivy, poison oak, and poison sumac. The 2 distinct phases in a type IV hypersensitivity reaction are the induction (ie, sensitization) phase and the elicitation phase. During the induction phase, an allergen, or hapten, penetrates the epidermis, where it is picked up and processed by an antigen-presenting cell. Most allergens in contact dermatitis are of low molecular weight and require minimal processing. However, many have a complicated structure and are significantly altered by the antigen-presenting cell. Antigen-presenting cells include Langerhans cells, dermal dendrocytes, and macrophages. The processed antigen is presented to T lymphocytes, which undergo blastogenesis in the regional lymph nodes. One subset of these T cells differentiates into memory cells, whereas others become effector T lymphocytes that are released into the blood stream. The elicitation phase occurs when the sensitized individual again is exposed to the antigen. The antigen penetrates the epidermis and is picked up and processed by an antigen-presenting cell. The processed antigen is presented to the circulating effector T lymphocytes that, in turn, produce lymphokines. These lymphokines mediate the inflammatory response that is characteristic of an allergic contact dermatitis. The elicitation phase requires several hours to develop, and, as a result, symptoms of allergic contact dermatitis usually develop hours to days following exposure. Once acquired, contact sensitivity tends to persist. The degree of sensitivity may decline unless boosted by repeated exposure, but with a high initial level of sensitivity, it may remain demonstrable throughout life. With photo contact dermatitis, irradiation of certain substances by light results in the transformation of the substance into an allergen (photoallergic) or an irritant (phototoxic). This transformation is usually wavelength specific for any individual substance. Dermatitis may develop following exposure to only ultraviolet A (UV-A), UV-B, or white light. Contact urticaria may be defined as a wheal-and-flare reaction that occurs after topical exposure to an agent. [7, 8] It may be immunologic, nonimmunologic, or of unknown mechanism. The immunologic type may be severe, with associated anaphylaxis. Nonimmunologic contact urticaria is the most common and is caused by agents that directly stimulate the release of vasoactive substances from mast cells (eg, bee venom). Contact reactions occur to pharmacologically active agents in some plants, most commonly plants in the family Urticaceae. Stinging nettles are in this family and are densely covered with coarse stinging hairs. The hairs consist of a tiny capillary tube with a small bladderlike base. Pressure on the bladderlike base injects fluid containing histamine, acetylcholine, and serotonin into the skin. The result is a typical triple response (ie, erythema, flare, and wheal formation) with itching noted in seconds and pruritus that lasts a few hours. Most stings are benign and require little or no therapy. The causes of contact dermatitis are innumerable and increase daily. The items listed below are some of the more common causes and may help expand the list of possible etiologies, which might need to be researched. Items identified in the history can be further researched either in the medical literature or in one of the extensive textbooks on contact dermatitis. Irritant contact dermatitis is a direct local cytotoxic effect of an irritant on the cells of the epidermis, with a subsequent inflammatory response in the dermis. Examples of irritants include acids; alkalis (eg, sodium, potassium, ammonium, calcium hydroxide compounds), which are frequently associated with hand eczemas following exposure to soaps, detergents, bleaches, ammonia preparations, lye, drain pipe cleaners, toilet bowl cleaners, or oven cleansers; bromine and chlorine, which are commonly used in hot tubs and swimming pools  ; and hydrocarbons such as crude petroleum, lubricating oils, and cutting oils. Long-term exposure may cause pruritus, folliculitis, calcifications, or acneiform eruptions. Creosote, asphalt, and other tar products may result in melanoderma. Creosote is a contact irritant, sensitizer, and photosensitizer. Irritant dermatitis from plants usually occurs after exposure to a particular part of the plant. The degree of toxicity may vary with the season, type of exposure, stage of maturity of the plant, and locality. The spurge plant family includes the most plants capable of producing irritant contact dermatitis and includes the poinsettia, crown-of-thorns, candelabra cactus, and pencil tree. These plants contain a highly irritating white milky sap that may cause erythema, desquamation, and bulla formation. Calcium oxalate is an irritant found in a number of plants, including Dieffenbachia, daffodils, hyacinths, and pineapples. Henna extract has long been used as a stain or dye that produces a temporary tattoo when applied to the skin. Sensitivity to ordinary henna tattoos that are brown in color is rare. However, PPD may be added to henna extract to darken the tattoo and reduce fixation time. PPD in the black henna tattoo mixture is at a significantly higher concentration than is found in commercial hair dye preparations and can induce severe sensitivity to PPD and severe allergic reactions. Allergic reaction to topical steroids used to treat eczema is not rare. As with any topical therapy, it may initially be soothing, but if the eczema continues to worsen, the patient may have developed a sensitivity to the active ingredient or a preservative. In patients suspected of having corticosteroid allergy, patch testing is required to confirm the diagnosis. As mentioned above, harsh soaps most commonly cause an irritant reaction, but allergic reactions to perfumes, dyes, lanolin, deodorants, or antiperspirants can occur. The family Anacardiaceae, which includes poison ivy, probably accounts for more cases of than all other plant families combined. The antigen in these plants is in an oleoresin known as urushiol (you-ROO-shee-ol). In poison ivy and poison oak, the antigen in urushiol is pentadecylcatechol. Slight molecular variations in catechols may result in large variations in the degree of antigenicity. Poison ivy and poison oak sap contains a near maximal percentage of the most allergenic catechols. Uninjured plants do not induce dermatitis. The plant must be injured or bruised before the oleoresin containing the urushiol can contact the skin. Smoke from burning plants may cause a severe dermatitis. All parts of the plant are antigenic, and under controlled conditions, more than 70% of the population in the United States reacts to the urushiol in poison ivy and oak. The plant family Anacardiaceae contains other species that also contain urushiol and cross-react with poison ivy. Mango contact dermatitis develops most commonly in the perioral region and on the hands and results from exposure to the peel, not the juice. Poison sumac is highly antigenic, resulting in severe contact dermatitis in sensitized patients. Symptoms occur as a result of direct exposure of skin to a photosensitizing agent followed by direct sun exposure. Many plants are known to cause a phototoxic response. These include the citrus family (eg, limes), the mulberry family (eg, figs), and the Umbelliferae family (eg, parsnip, celery). Lime juice exposure is most common when limes are squeezed into beverages. Excess juice dribbles down the arm or neck. 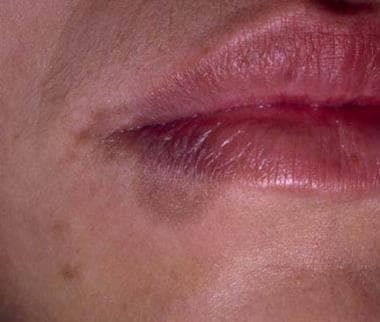 Sun exposure of this lime juice produces linear streaks of dermatitis or hyperpigmentation. Perfumes also are common sources of photo contact dermatitis. Contact urticaria from rubber occurs almost exclusively from the use of rubber gloves. Nonimmunologic contact urticaria results in local edema and erythema. It is more common than the immunologic mechanism. Agents that produce nonimmunologic contact urticaria include jellyfish; Portuguese man-of-war; balsam of Peru; caterpillar hair; moths; insect stings; benzoic, sorbic, cinnamic, or nicotinic acid; and nettles (plants). In one report, 18 out of 20 children aged 1-4 years developed perioral contact urticaria after smearing a salad dressing around their mouths. This was traced to sorbic acid and benzoic acid in the dressing. Contact reactions to pharmacologically active agents primarily involve plants in the family Urticaceae (eg, stinging nettles). Contact dermatitis is exceedingly common, accounting for 4-7% of all dermatologic consultations, and is consistently among the top 10 causes for patient visits in primary care clinics. Each year, 10-50 million people in the United States develop an allergic rash after contact with poison ivy, poison sumac, or poison oak. The incidence of contact dermatitis in the pediatric age group is debated, but allergic contact dermatitis affects approximately 20% of all children at some time. Approximately 20-35% of healthy children react to one or more allergens on standard patch tests. Among worker's compensation claims for dermatologic conditions, 90% are due to contact dermatitis. Children of parents who experience contact dermatitis are 60% more likely to have positive patch test results. The most common environmental allergens appear to be the same in Europe and the United States. Allergens such as benzocaine, neomycin, and lanolin are common in all countries. However, each country has a small number of locally unique topical medications, which are a source of allergens. Rhus dermatitis is extremely common in the United States but virtually nonexistent in Europe. The level of sensitivity to a specific allergen in a population changes over time. Some allergens come and go, and the perceived incidence of sensitivity to an individual substance depends on many variables. Contact dermatitis is thought to affect whites more frequently than people of other races. People with fair skin and red hair are the most vulnerable. Contact dermatitis is most common during adulthood, but it affects people of all ages. The type of contact dermatitis is frequently age related. Infants are most likely to have irritant contact dermatitis in the diaper area. Toddlers and older children become increasingly exposed to poison ivy, poison oak, and poison sumac. Adolescents are more likely to develop irritant reactions from excessive exposure to soaps and allergic reactions to nickel and to preservatives in creams and lotions. The recent trend of piercing ears in infants and body piercing by adolescents can be expected to lower the average age at which nickel allergy occurs. The prognosis in patients with contact dermatitis depends on the cause and the possibility of avoiding repeated or continued exposure to the causal allergen or irritant. Most contact dermatitis resolves without intervention in 4-6 weeks if further exposure is prevented. Obviously, long-term success in treatment is poor if the correct diagnosis and offending agent are not identified. Numerous individual factors are also important in prognosis. Although an alert patient can reduce contact, some ubiquitous allergens, such as rubber or nickel, are impossible to totally avoid. Exposure can be reduced with careful instruction, but occult exposures may produce chronic or recurrent symptoms. Some allergens probably are still unknown, and the significance of others may not be fully realized yet. New sensitivities to topical medications or other substances may develop during the course of dermatitis. Sensitivity to rubber gloves may complicate dermatitis of the hands. Sensitivity to neomycin may complicate the course when applied to an infected dermatitis. During a long course of relapsing dermatitis, sensitivity to various allergens may accumulate, increasing the risk of recurrence. Contact dermatitis of the hands is generally of mixed origin, caused by alternating or simultaneous exposure to allergens and irritants. Half of patients with hand dermatitis have had symptoms of dermatitis for more than 5 years. When followed up after 6-22 months, one quarter of the patients heal completely, half of the patients improve, and one quarter of the patients are unchanged or worse. No difference in prognosis between irritant and allergic dermatitis is observed. Relapses or chronicity is due not only to reexposure to allergens and irritants, but also to other contributory mechanisms. The barrier function of the skin is impaired for months or even years after an episode of dermatitis. Recovery can be prevented by exposure to irritants or allergens in concentrations that may be tolerated by normal skin. Inappropriate treatment with irritants or allergens, such as overzealous use of cleansers and antiseptics, use of various popular or herbal remedies, or both, may prolong the course. Secondary infection is common in chronic contact dermatitis, preventing normal recovery. Latex allergy is common among medical professionals, such as dentists and surgeons. In rare cases, this may have a significant impact on their medical practice. Anaphylaxis and death can occur following epidermal exposure to some antigens. Antigens such as latex rarely produce an immunoglobulin E (IgE)–mediated immediate hypersensitivity reaction that results in anaphylactic shock. Extensively counsel patients with documented contact dermatitis on possible sources of future exposure. If possible, provide a written list of potential sources. Although listing every potential source of exposure is impossible, provide the patient with the name of the contactant and related chemical compounds. Failure to do so may result in the patient experiencing unnecessary exposure and dermatitis. In cases of extreme sensitivity, exposure may produce severe or fatal reactions. Patch testing can be extremely important in diagnosing the cause of allergic contact dermatitis; however, patients forget more than 40% of identified allergens. Provide a printed list of sources of allergic contact to the patient. Discuss sources of allergic contact with the same or cross-reacting allergens. Discuss prognosis. Acute allergic contact dermatitis may take several weeks to completely resolve. Recurrences are common unless the contactant is identified and avoided. Provide instructions for reduction of further contact, identification of sources of contactant, barrier protection, good skin care, and hygiene. Advise patients that allergy does not disappear when the dermatitis clears. Risk of relapses usually persists throughout life. 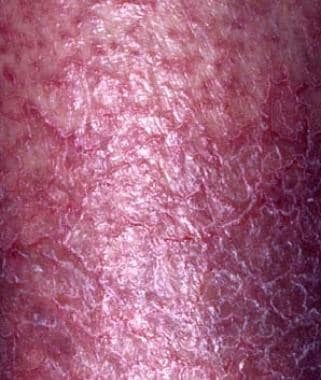 Following significant episodes of dermatitis, the area of involved skin may be especially sensitive to recurrences for several months. Allergic contact dermatitis may be prolonged by subsequent contact with weak irritants. Conversely, patients with irritant dermatitis may develop an undetected secondary allergy to an ingredient of creams or rubber gloves being used to treat the initial dermatitis. 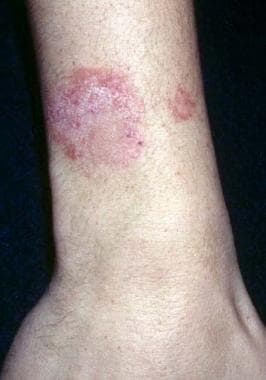 Secondary infection is common in subacute or chronic contact dermatitis. 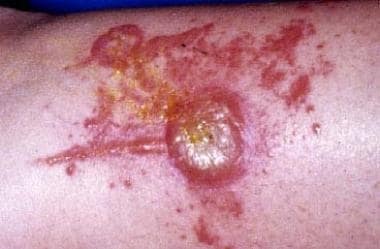 If the contact dermatitis is resistant to appropriate therapy or suddenly worsens for no particular reason, secondary bacterial infection should be considered. Urushiol, the allergen in poison ivy, can remain active for months. Exposed clothing, shoes, tools, camping equipment, and pets must be washed thoroughly. If rhus dermatitis is a problem, patients must learn to recognize the plants and have them removed from areas where children are likely to play. The American Academy of Dermatology has handouts with color photographs available for purchase or viewing on their web site. Wearing a long-sleeved shirt, pants, gloves, and boots when in areas infested with poison ivy and bathing as soon as possible after exposure are effective methods for reducing rhus dermatitis. Occupational contact dermatitis is a major problem. Patients may need assistance with positively identifying irritants or allergens in the work place. Once identified, the patient's environment must be appropriately adjusted. Patients may need assistance with documentation for worker's compensation claims. For patient education information, see Skin, Hair, and Nails Center, as well as Contact Dermatitis and Eczema. Lee PW, Elsaie ML, Jacob SE. Allergic contact dermatitis in children: common allergens and treatment: a review. Curr Opin Pediatr. 2009 Aug. 21(4):491-8. [Medline]. Militello G, Jacob SE, Crawford GH. Allergic contact dermatitis in children. Curr Opin Pediatr. 2006 Aug. 18(4):385-90. [Medline]. Sung CT, McGowan MA, Jacob SE. Allergic Contact Dermatitis Evaluation: Strategies for the Preschooler. Curr Allergy Asthma Rep. 2018 Aug 1. 18 (10):49. [Medline]. Fisher AA, Rietschel RL, Fowler JF. Fisher's Contact Dermatitis. 4th ed. Philadelphia, PA: Lippincott, Williams & Wilkins; 1995. Silny W, Bartoszak L, Jenerowicz D, Zukiewicz-Sobczak W, Gozdziewska M. Prevalence of contact allergy in children suffering from atopic dermatitis, seborrhoeic dermatitis and in healthy controls. Ann Agric Environ Med. 2013 Mar 25. 20(1):55-60. [Medline]. Munivrana Skvorc H, Plavec D, Munivrana S, Skvorc M, Nogalo B, Turkalj M. Prevalence of and risk factors for the development of atopic dermatitis in schoolchildren aged 12-14 in northwest Croatia. Allergol Immunopathol (Madr). 2012 Dec 17. [Medline]. de Lagrán ZM, de Frutos FJ, de Arribas MG, Vanaclocha-Sebastián F. Contact urticaria to raw potato. Dermatol Online J. 2009 May 15. 15(5):14. [Medline]. Kennedy JL, Stallings AP, Platts-Mills TA, Oliveira WM, Workman L, James HR, et al. Galactose-a-1,3-galactose and Delayed Anaphylaxis, Angioedema, and Urticaria in Children. Pediatrics. 2013 Apr 8. [Medline]. Salvaggio HL, Scheman AJ, Chamlin SL. Shock Treatment: Swimming Pool Contact Dermatitis. Pediatr Dermatol. 2012 Nov 7. [Medline]. Jacob SE, McGowan M, Silverberg NB, Pelletier JL, Fonacier L, Mousdicas N, et al. Pediatric Contact Dermatitis Registry Data on Contact Allergy in Children With Atopic Dermatitis. JAMA Dermatol. 2017. 153:765-770. [Medline]. Spencer A, Gazzani P, Thompson DA. Acrylate and methacrylate contact allergy and allergic contact disease: a 13-year review. Contact Dermatitis. 2016 Sep. 75 (3):157-64. [Medline]. Muttardi K, White IR, Banerjee P. The burden of allergic contact dermatitis caused by acrylates. Contact Dermatitis. 2016 Sep. 75 (3):180-4. [Medline]. Liu T, Wan J, McKenna RA, Jackson OA, Treat JR. Allergic contact dermatitis caused by Dermabond in a paediatric patient undergoing skin surgery. Contact Dermatitis. 2019 Jan. 80 (1):61-62. [Medline]. Akan A, Toyran M, Vezir E, Azkur D, Kaya A, Erkoçoğlu M, et al. The patterns and clinical relevance of contact allergen sensitization in a pediatric population with atopic dermatitis. Turk J Med Sci. 2015. 45 (6):1207-13. [Medline]. Yu J, Treat J, Chaney K, Brod B. Potential Allergens in Disposable Diaper Wipes, Topical Diaper Preparations, and Disposable Diapers: Under-recognized Etiology of Pediatric Perineal Dermatitis. Dermatitis. 2016 May-Jun. 27 (3):110-8. [Medline]. Chang MW, Nakrani R. Six children with allergic contact dermatitis to methylisothiazolinone in wet wipes (baby wipes). Pediatrics. 2014 Feb. 133 (2):e434-8. [Medline]. Clemmensen O, Hjorth N. Perioral contact urticaria from sorbic acid and benzoic acid in a salad dressing. Contact Dermatitis. 1982 Jan. 8(1):1-6. [Medline]. Brasch J, Geier J. Patch test results in schoolchildren. Results from the Information Network of Departments of Dermatology (IVDK) and the German Contact Dermatitis Research Group (DKG). Contact Dermatitis. 1997 Dec. 37(6):286-93. [Medline]. Warshaw E, Lee G, Storrs FJ. Hand dermatitis: a review of clinical features, therapeutic options, and long-term outcomes. Am J Contact Dermat. 2003 Sep. 14(3):119-37. [Medline]. Raikhlin-Eisenkraft B. Contact dermatitis from occupation-induced injury. Isr Med Assoc J. 2009 May. 11(5):322. [Medline]. Litvinov IV, Sugathan P, Cohen BA. Recognizing and treating toilet-seat contact dermatitis in children. Pediatrics. 2010 Feb. 125(2):e419-22. [Medline]. Pigatto P, Martelli A, Marsili C, Fiocchi A. Contact dermatitis in children. Ital J Pediatr. 2010 Jan 13. 36:2. [Medline]. [Full Text]. Borok J, Matiz C, Goldenberg A, Jacob SE. Contact Dermatitis in Atopic Dermatitis Children-Past, Present, and Future. Clin Rev Allergy Immunol. 2018 Sep 17. [Medline]. Yu J, Atwater AR, Brod B, Chen JK, Chisolm SS, Cohen DE, et al. Pediatric Baseline Patch Test Series: Pediatric Contact Dermatitis Workgroup. Dermatitis. 2018. 29:206-212. [Medline]. Fonacier LS, Aquino MR, Mucci T. Current strategies in treating severe contact dermatitis in pediatric patients. Curr Allergy Asthma Rep. 2012 Dec. 12(6):599-606. [Medline]. American Academy of Allergy, Asthma and Immunology; American College of Allergy, Asthma and Immunology. Contact dermatitis: a practice parameter. Ann Allergy Asthma Immunol. 2006 Sep. 97(3 Suppl 2):S1-38. [Medline]. Disclosure: Received income in an amount equal to or greater than $250 from: Valeant Pharmaceuticals.